4Patches4Hope began as a desire to use my passion for quilting and the power of social media and word of mouth to create comfort quilts for those undergoing cancer treatments and also raise money for cancer research. It was to begin on my mother’s birthday –today - October 4, 2011 and be a birthday gift to her. Unfortunately Mom’s cancer had a different timetable, and on July 12, 2011 her battle with this disease ended. I decided to forge forward in her memory. We are preparing for our trip to SC for Easter -and I've been busy trying to finish up quilts to deliver them while we are down there. So far of the 7 that have been delivered, 5 were driven down, and 2 were combined in Christmas shipping packages, so I have managed to keep my delivery costs to a minimum. The latest 5 were finished up this morning and came out of the dryer just in time for the sun to break through the clouds a bit for a photo session. We've been pretty snowy still, but we had a bit of a thaw today so there are patches of - um - brown showing through the white. There are some peeks of growth where the tulips and daffodils are - and Mom always said it couldn't be spring until it snowed on the blooming daffodils, so it is not far off. Made from donated patches -and the first quilt to be dedicated in honor of someone. One of my favorite fabrics in this quilt (and nearly overall from the donated blocks) - makes me think of Japan. The back of the dedicated quilt - the two blocks in this backing strip were made by the person who sponsored the quilt. One of mine - I saw this pattern free online and couldn't get it out of my head, so I made it with some donated fabric. It is a little busy in person - but photographed really nicely. Another one of mine - made with leftover bits from a bargello I made as a gift. 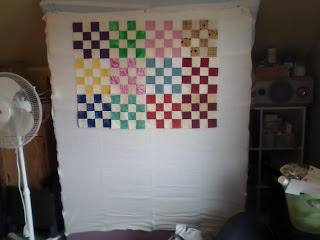 The chevron is not as noticeable in this photo as the light fabrics disappeared a bit, but this is very light and springy. Black and purple donated blocks - I didn't have enough of either color to do a full 14 strips. This one is more masculine feeling overall. Another one of mine inspired by a free pattern online. This one was a good example of the importance of consistent seam allowances... my strips ended up off by quite a bit at the end (hidden by the wind) but it still made a cheery and cozy quilt. Some of the blocks in the quilt were made by tiny 4 patches - measuring 2.5" - using up lots of little bits in every project. More to come -just not for this trip. I am working on sock monkeys now as gifts for family members - so a completely different kind of sewing. In February, I told you about a mystery quilter who had sent a beautiful completely finished quilt in a box with no name, no note, no return address. The quilt was very large - and the places I have been working with were requesting smaller quilts - so I set this one aside, knowing the right time and place would come for this quilt to find a home. And then just after Halloween, the email came from a friend of mine in Georgia. Her college roommate lived in the path of Hurricane Sandy - and though her home was intact, she was without power and had taken in her sister and her sister's friend, both of whom had lost their homes entirely. I think Mom must have "nudged" me - because that night I took my 7 year old son shopping, and we put together a care package of foods, hand warmers, gloves, and other items, bundled them all up with the quilt, and sent them off to Long Island. A hug passed from Kentucky to Long Island by way of me. A hug intended to bring comfort and warmth - and though it didn't go to a cancer patient (at least not that I know of) - it did go to someone who is suffering and will be going through a long recovery process. It felt like the right home for this quilt... thank you again, my mystery quilter. In this whole experience, the toughest challenge for me has been "taming the chaos" - all these beautiful blocks but with such different fabric choices... setting each of them into something that will make them ALL shine is intimidating at times. I have posted in the past about my initial approach of strips of 12 similar or identical blocks - and that stripe layout was used in the first few quilts that were donated. Now I am working with groups of 4 - turning them into 16 patches. I now have a design wall, so I can toss the blocks up there as I make them and ponder the possibilities of layout into the final quilt. Each one will take 6x7 of these 16 patches, and I think the finished result will work nicely! I have a bunch paired up and ready to chain piece - one of the nice things about being home for Thanksgiving and not having to travel is having a little extra bit of sewing time over the weekend. This year I am thankful for ALL OF YOU and the support you have given me through this project. Two more quilts are on their way to be delivered - neither is a 4Patch, but both are made from fabrics that were donated. Quite a bit of fabric, in fact. All from the same fabric line. These are 2 of 3 that were assembled (the third is not sandwiched up yet) - and there is enough for probably 2 more big block quilts -and plenty to work into 4 patches. Please look at the link above- this young mother lives near me, and her young sons are in our school district just behind my son. Thanks for all you do for those with cancer. Although I am still gladly accepting all donations of 4 patches, I am realizing that I need to shift my focus to the materials I need to finish the many quilts that these blocks will create. On Saturday I am going to a quilt show/craft show, where I will have a booth to promote 4Patches4Hope and sell some small handcrafted items to help raise funds for batting, backing and thread supplies. At that time, I am also debuting a quilt sponsorship form, which will allow anyone (including any of you) to dedicate a quilt in honor or in memory of anyone. I will take that information and incorporate it into the label that goes on the finished quilt. Sponsorships are $20 per quilt, and can be in the form of checks (made out to Regina Arlauckas) or $20 JoAnn's gift cards. I can also take PayPal - and you can contact me if you wish to pursue that option. If you would rather donate backings, I am looking for 2 yard pieces of 44" wide fabrics (or wider). At this time, it is easier for me to purchase batting myself as storing odds and ends of batting is not feasable. Please note that I am not a registered charity, so these cannot count as tax deductions. I can only promise to use any funds in the most economical and frugal way possible, and to direct them all to materials for these quilts. When I first started 4Patches4Hope, it was a remembrance of my mother, and a chance to do something in her memory for chemotherapy and radiation patents alike. Now, as we are nearing the one year mark since Mom's passing, my very own sister is beginning radiation treatment of her own. Terri - who was Mom's medical advocate and companion to nearly every treatment. Terri - who accompanied me to deliver the first batch of quilts in April. After a whirlwind few days in early May surrounding an American Cancer Society Relay for Life, bug up the nose, blinding headaches and MRI's, Terri was diagnosed with a benign atypical meningioma - 3cm in size. Surgery was scheduled quickly, went well (she was posting to Facebook not 24 hours later) and her recovery has been strong and steady - but a bit remains - so her 6 week course of radiation begins soon. In the same facility where Mom was treated. Thanks to the support of all the quilters around the world who have sent blocks - I know she will be warm in the radiation waiting area. More quilts are in progress. And for those who ask - YES I am still accepting blocks. 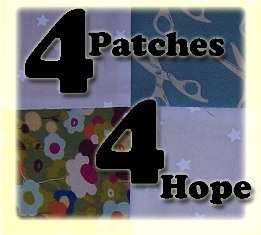 4Patches4Hope is simple - Make a 4 Patch... Make a Donation... Make a difference. 1. Make light-dark 4 patch block(s) using 2 1/2” squares (assembled blocks should be 4 1/2” square). 4. WE REACHED OUR BLOCK GOAL of 4000 - AND WE WILL KEEP COLLECTING!! !